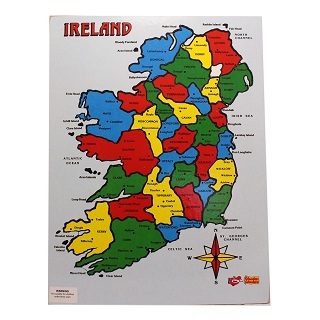 Wonderful Irish made bright and colourful map of Ireland jigsaw from Lisheen Toys in Ballyheigue, Co Kerry. Measuring 30cm x 40cm this map is challenging map of Ireland boasts the names of all the counties in Ireland along with the main provincial towns. A great educational toy this map has 27 different pieces in all and also includes the names of islands and seas of the coast of Ireland.